I know, it’s a hoot. That her name is “Rose” is the capper, I think the writer must have done it on purpose. 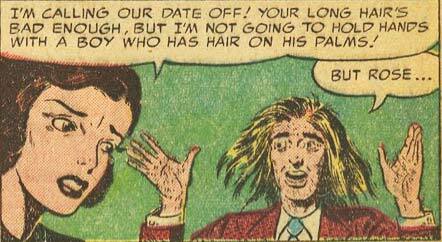 Just FYI, the story is that this guy starts growing really long hair — a precursor to the “long-haired hippie” fears? — all over his body. He has to eat like crazy to keep the hair alive, as it’s basically a life form, and eventually he’s just a big walking pile of human-shaped hair. Eventually its hunger can only be satisfied by eating people. The coppers manage to lure it into a chemical factory with vats full of depilatories (I kid you not) and the creature dissolves into a pile of dandruff. I believe Head and Shoulders should buy the option on the story, myself. That sounds…weirdly familiar. I think it might have been re-tooled into a Tales from the Darkside episode or something. Company sells some sort of tonic to balding men, the hair starts growing out of control and turns out to be alien in origin and totally evil…something like that, it’s been a long time. Tales from the Darkside, and episode with Stacey Keatch. An alien species is stuck on Earth. The only food they can find for their young in human brains. Babies are ‘seeded’ on the customers and look like hair growth, but slowly eat away at the brain. Bizarre.